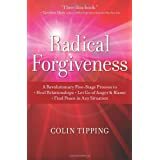 I was introduced to Radical Forgiveness in 2002 when I was in the midst of a problem that I just could not solve. The forgiveness I experienced through following the steps in Radical Forgiveness, especially the worksheet “Making Room For The Miracle” were miraculous. It gave me an exit from the emotional pain, anger and hate that was in the process of consuming my life.